When seeking relaxation from the constant stresses of your busy life, you should point your car in the direction of the lush countryside that is Brown County. Things just seem to run at a more leisurely pace out here…and you owe it to yourself to sit back and contemplate nature’s beauty. 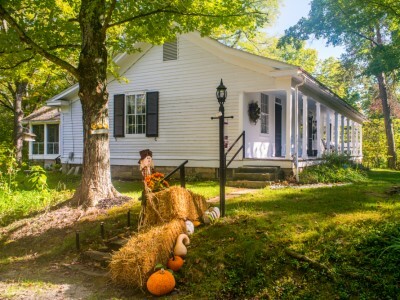 A Whispering Valley is a charming country manor that reflects the country living lifestyle of days gone by, yet has the modern amenities you would expect for today. The beautiful drive to this getaway winds through some gorgeous territory, and once you arrive you’ll soon begin to decompress. This comfortable home welcomes families, and yes, even little Fido is invited to accompany his master, because what doggie doesn’t love a fine romp in a different yard? So many new smells…so little time. Parents will appreciate the cozy queen bed in the master bedroom, and the kids can draw straws to see who wins rights to the queen bed in the second bedroom, or the third bed room. This cabin has one full bath with a tub/shower. Wide-plank wood floors, painted wood walls, ceilings, and numerous interesting built-in cupboards and cabinetry add to the ambience of A Whispering Valley. It is like stepping back in time but with the high tech world’s upgrades of two hi-def flat screen TV’s, as well as wireless internet service, so you can post to your Facebook account about all the great fun you’re having here. The cute-as-a-button kitchen is amply outfitted to render some hearty fare for everyone, as you gather in the sunny breakfast nook, or at the larger dining room table. Two gas-log fireplaces will make things even cozier when you snuggle up with those you hold close to your heart. An open porch spans the front of the house, where a little nap in the rocking chairs or porch swing sounds mighty enticing. The back of the of the house has a screened porch with cute wicker chairs for reading or conversation, as well as a dining table for meals or playing cards. Have the kids pack their favorite games, and get back to family game night. An outdoor picnic table and rustic log seating surrounds the campfire pit, where roasting hot dogs and marshmallows is always a family favorite. We recommend you pass a little time showing the kiddos how to bait a hook…or just simply listen to the croaking frogs around the pond’s edge. Enjoy a family hike along the creek side trails on the property, or maybe you’d like mountain biking or horseback riding in nearby Brown County State Park… all these outdoor activities allow communing with Mother Nature on an up close and personal level. Then, a relaxing soak in the steamy hot tub will sooth the “good kind of tired” that you’ll experience from spending a few days in Indiana’s favorite outdoor playground. Why not let A Whispering Valley share her secrets to you soon? Call or go online now to secure your preferred dates…you’ll be glad you did!